Cambridge, Mass. – February 13, 2014 – On the plains of Namibia, millions of tiny termites are building a mound of soil—an 8-foot-tall “lung” for their underground nest. During a year of construction, many termites will live and die, wind and rain will erode the structure, and yet the colony’s life-sustaining project will continue. 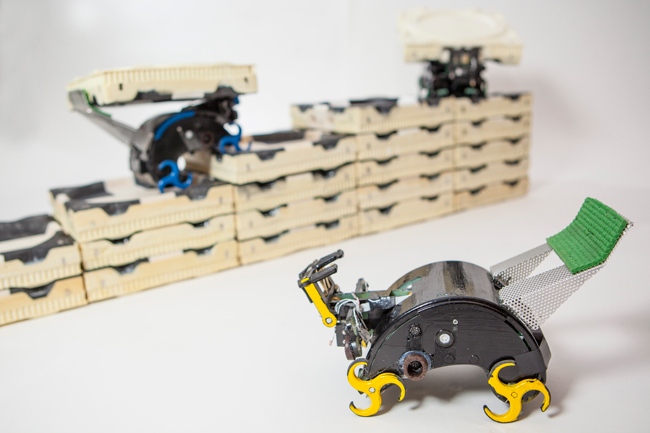 Inspired by the termites’ resilience and collective intelligence, a team of computer scientists and engineers at the Harvard School of Engineering and Applied Sciences (SEAS) and the Wyss Institute for Biologically Inspired Engineering at Harvard University has created an autonomous robotic construction crew. The system needs no supervisor, no eye in the sky, and no communication: just simple robots—any number of robots—that cooperate by modifying their environment.